PARIC has completed work on an extensive, $48.7 million addition and renovation at Laclede Groves continuing care retirement community. 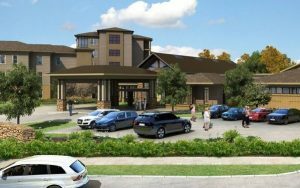 Work included a four-story, 60 bed addition to the skilled nursing facility, renovation of the existing skilled nursing facility into households, interior demolition and reconstruction of 30,000 sq. ft. of the Town Center Building, a new 80 unit independent living building with below grade parking. A 3,000 sq. ft. therapy pool addition, and a new single-story bistro and fine dining venue were also constructed. Additionally, other spaces were renovated and upgraded, and a new central laundry facility was constructed to serve all St. Louis campuses of Lutheran Senior Services. Streets and sidewalks were realigned throughout the campus for better traffic flow and safer walking areas. As a part of the sidewalk realignment, all stairs and curbs were eliminated, and sidewalks were re-built to ensure that only modest slopes are present to ensure residents are able to comfortable walk throughout the rolling, treed campus.